Vermont independent Sen. Bernie Sanders wants to be the next president of the United States. On Thursday he declared "we're in this race to win" and highlighted key areas he'll seek to differentiate himself from Hillary Clinton in the Democratic presidential primary. If you’re like me, you don’t know a lot about this feisty politician. Sanders is a self-described democratic socialist, and has praised Scandinavian-style social democracy. Sanders runs for office as an independent but caucuses with the Democratic Party and is counted as a Democrat for purposes of committee assignments. He was the only independent member of the House during most of his service and is the longest-serving independent in U.S. Congressional history. Since January 2015, Sanders has been the Ranking Democratic Member on the Senate Budget Committee. Sanders is a vocal advocate about the ramifications of global warming. Sanders supports the DISCLOSE Act, which would make campaign finances more transparent and ban U.S. corporations controlled by foreign interests from making political expenditures. 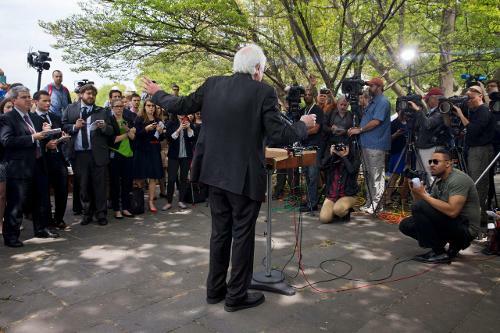 Sanders has been a leader in calling for media reform and opposes increased concentration of ownership of media outlets, as well as being a contributing author for OpEdNews. He appeared in Orwell Rolls in His Grave and Outfoxed: Rupert Murdoch's War on Journalism, two documentaries on the subject.